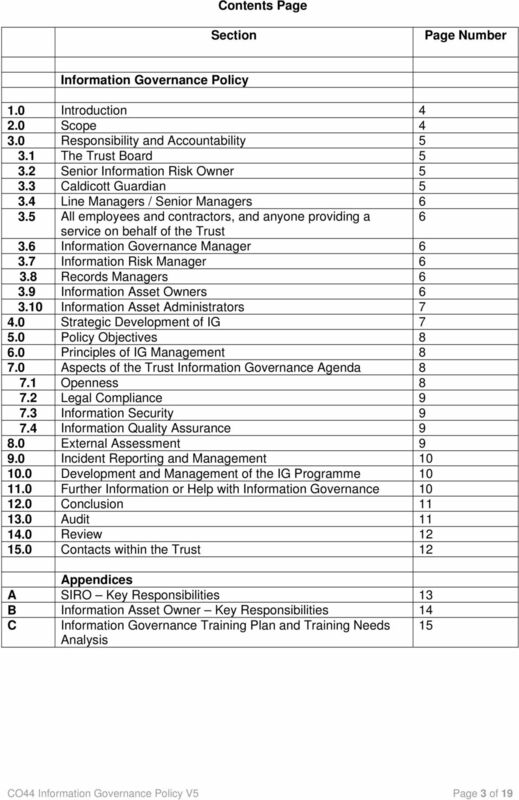 Download "Policy Document Control Page"
16 Information security is a key element of the IG agenda. The information security assurance framework should be supported by adequate skills, knowledge and experience across the whole organisation. The levels of competency should be commensurate with the duties and responsibilities of particular posts or staff groups to provide an adequate level of assurance. 1.3 Requirement No. 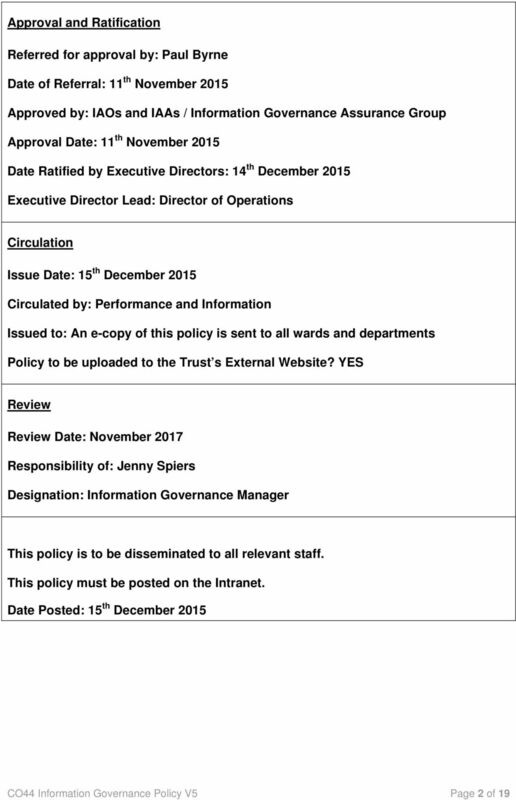 307 An effectively supported Senior Information Risk Owner (SIRO) takes ownership of the organisation s information risk policy and information risk management strategy. 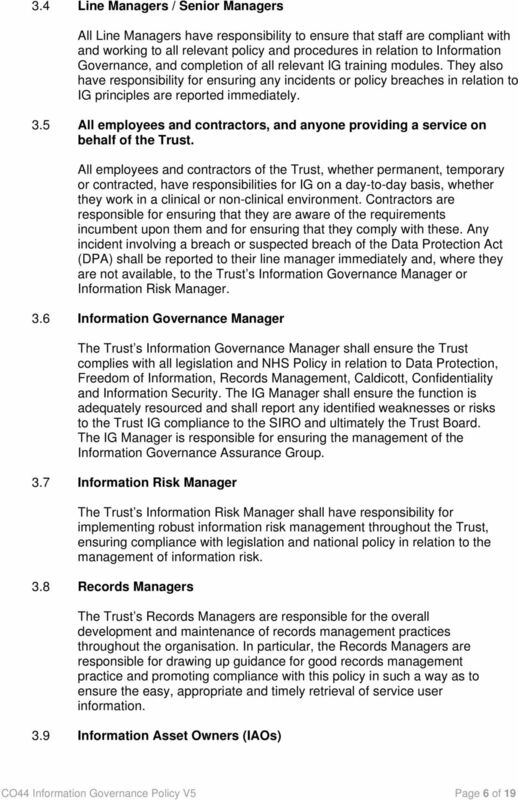 Organisations should ensure that appropriately senior individuals are allocated responsibility for owning information risk. 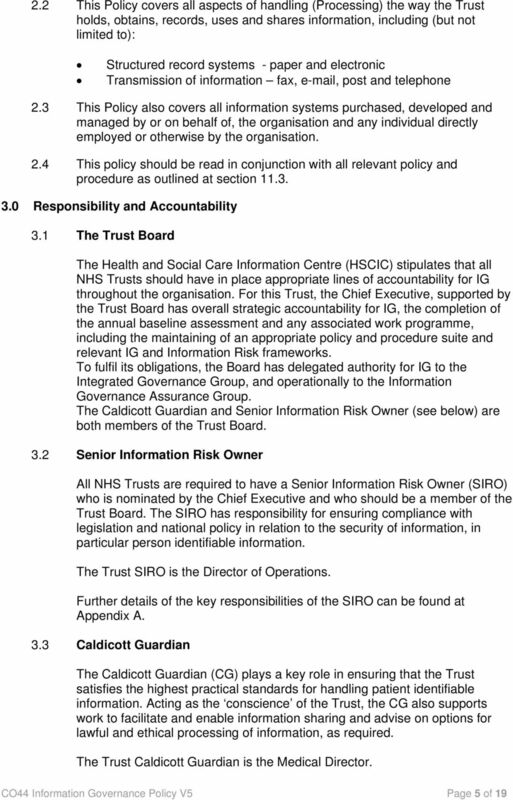 In NHS organisations this role is referred to as the Senior Information Risk Owner (SIRO), who should be an Executive Director or other senior member of the Board (or equivalent), e.g. senior management committee. 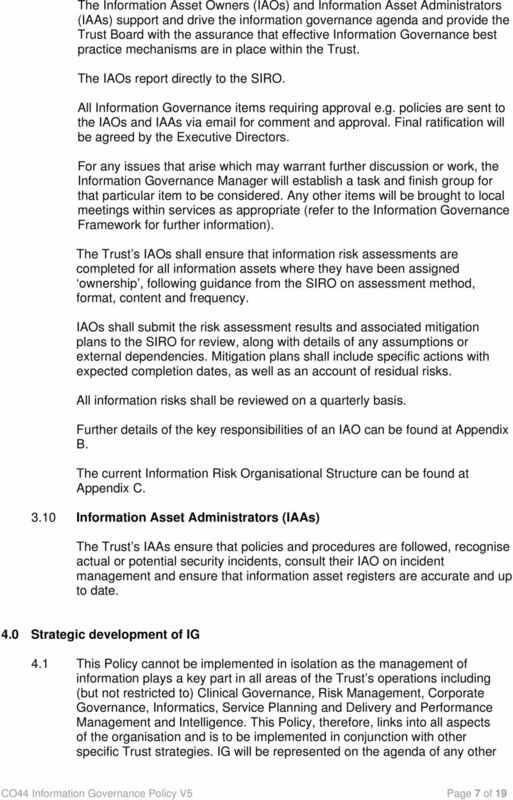 SIROs should be familiar with information risks and the organisation s response to risk to ensure they can provide the necessary input and support to the Board and to the Accounting Officer. 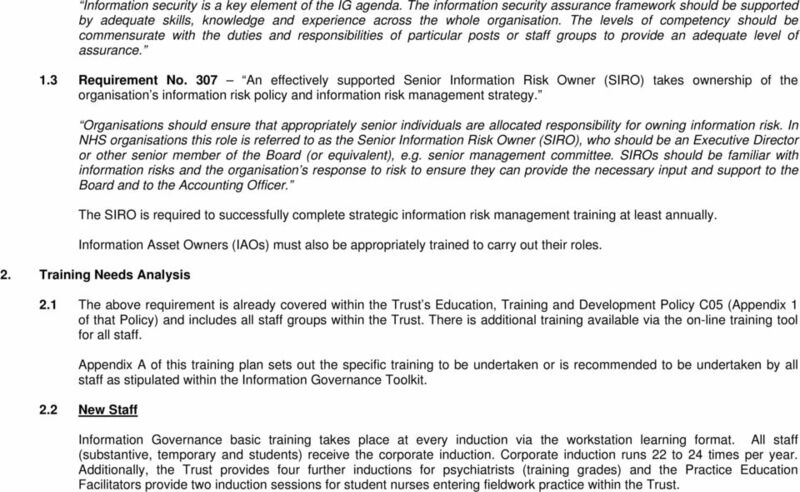 The SIRO is required to successfully complete strategic information risk management training at least annually. 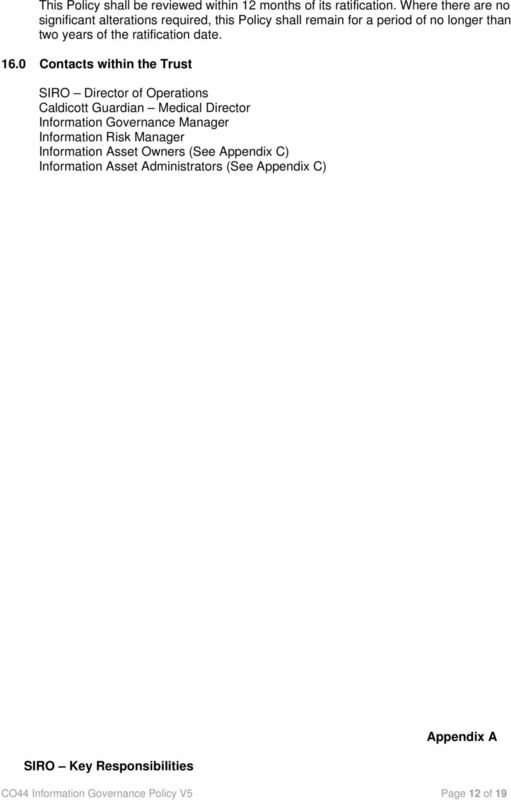 Information Asset Owners (IAOs) must also be appropriately trained to carry out their roles. 2. 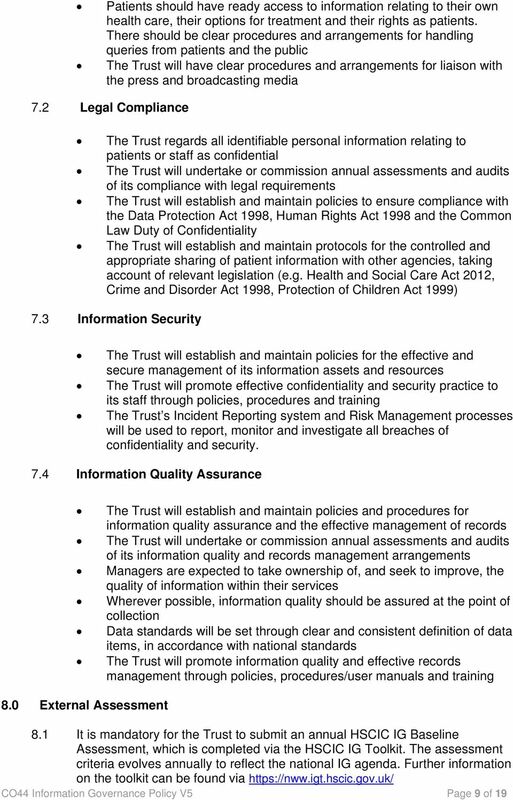 Training Needs Analysis 2.1 The above requirement is already covered within the Trust s Education, Training and Development Policy C05 (Appendix 1 of that Policy) and includes all staff groups within the Trust. There is additional training available via the on-line training tool for all staff. 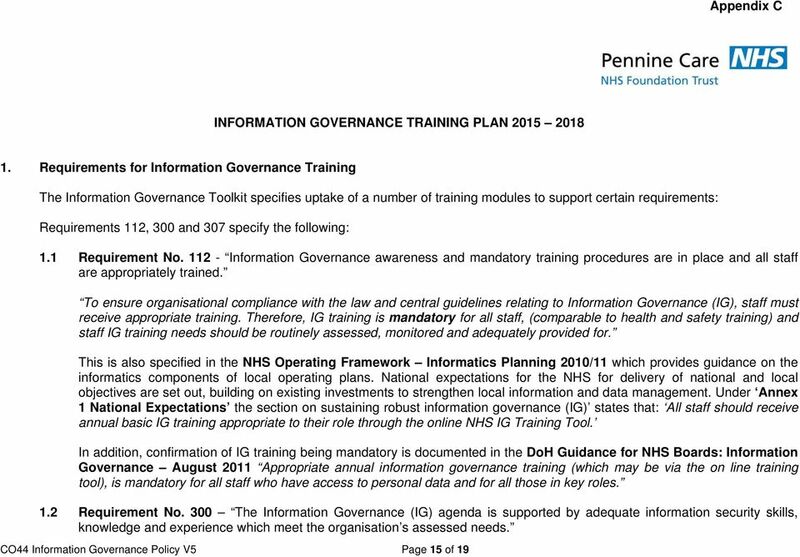 Appendix A of this training plan sets out the specific training to be undertaken or is recommended to be undertaken by all staff as stipulated within the Information Governance Toolkit. 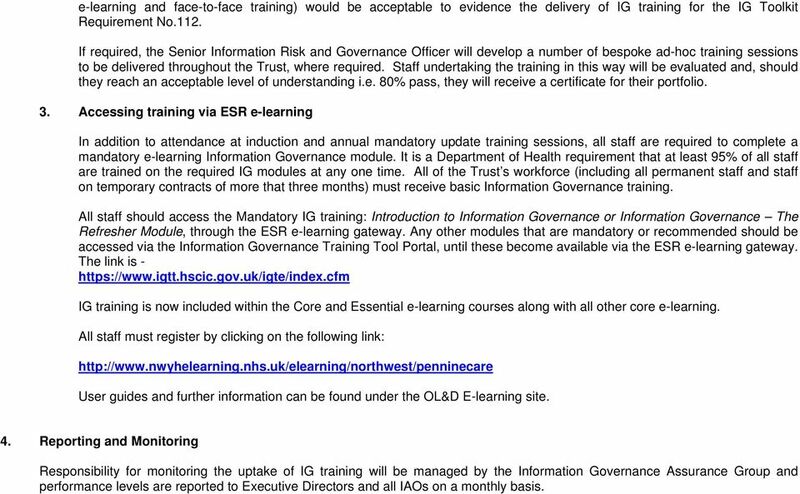 2.2 New Staff Information Governance basic training takes place at every induction via the workstation learning format. All staff (substantive, temporary and students) receive the corporate induction. Corporate induction runs 22 to 24 times per year. Additionally, the Trust provides four further inductions for psychiatrists (training grades) and the Practice Education Facilitators provide two induction sessions for student nurses entering fieldwork practice within the Trust. 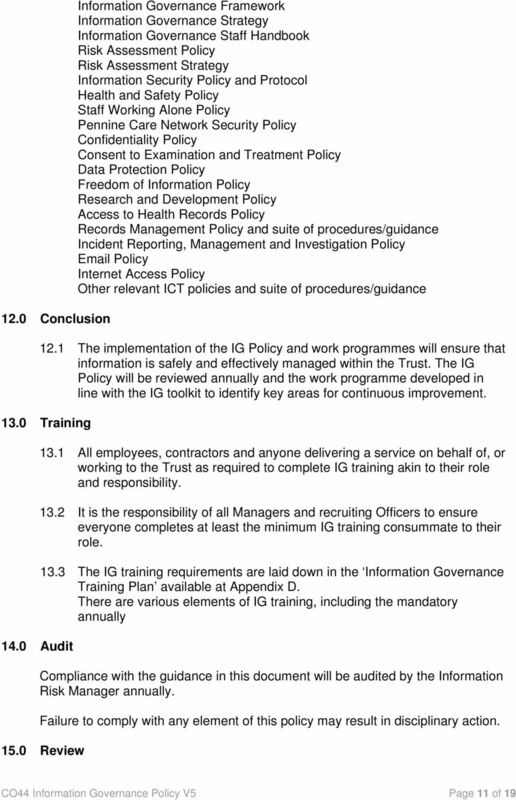 18 e-learning and face-to-face training) would be acceptable to evidence the delivery of IG training for the IG Toolkit Requirement No.112. 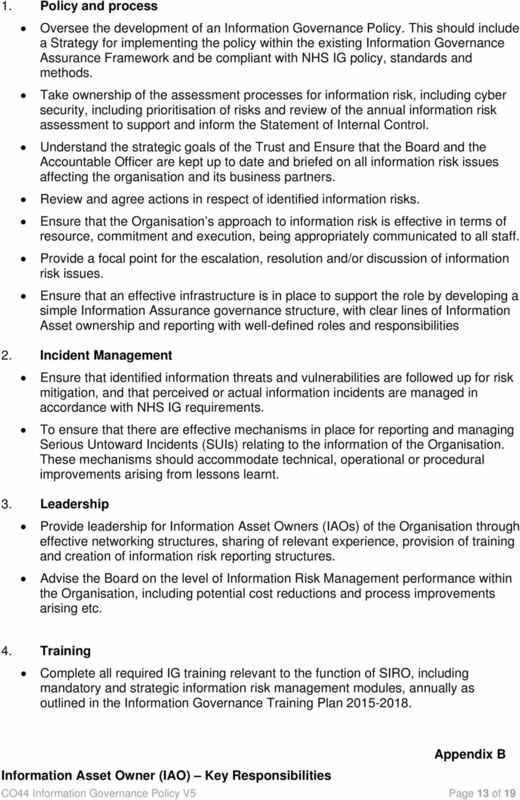 If required, the Senior Information Risk and Governance Officer will develop a number of bespoke ad-hoc training sessions to be delivered throughout the Trust, where required. Staff undertaking the training in this way will be evaluated and, should they reach an acceptable level of understanding i.e. 80% pass, they will receive a certificate for their portfolio. 3. Accessing training via ESR e-learning In addition to attendance at induction and annual mandatory update training sessions, all staff are required to complete a mandatory e-learning Information Governance module. 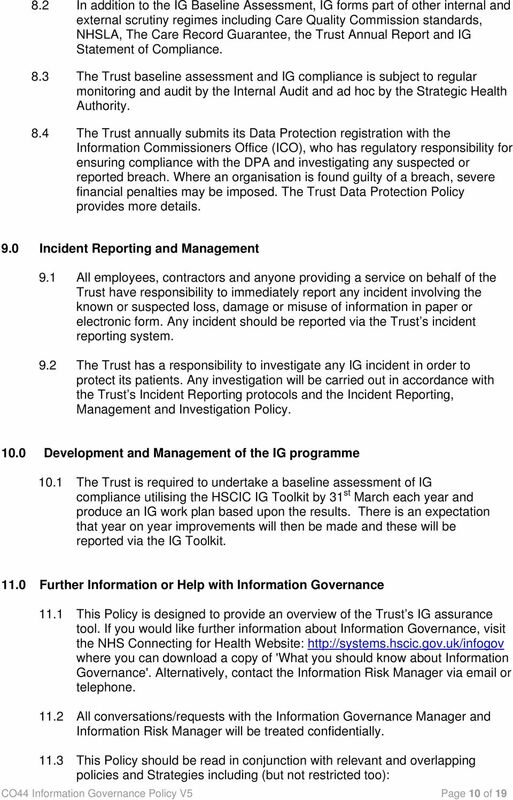 It is a Department of Health requirement that at least 95% of all staff are trained on the required IG modules at any one time. 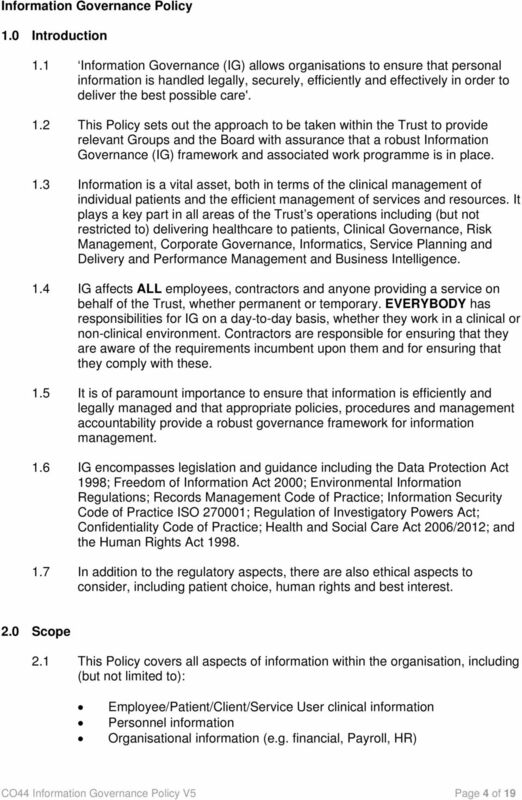 All of the Trust s workforce (including all permanent staff and staff on temporary contracts of more that three months) must receive basic Information Governance training. 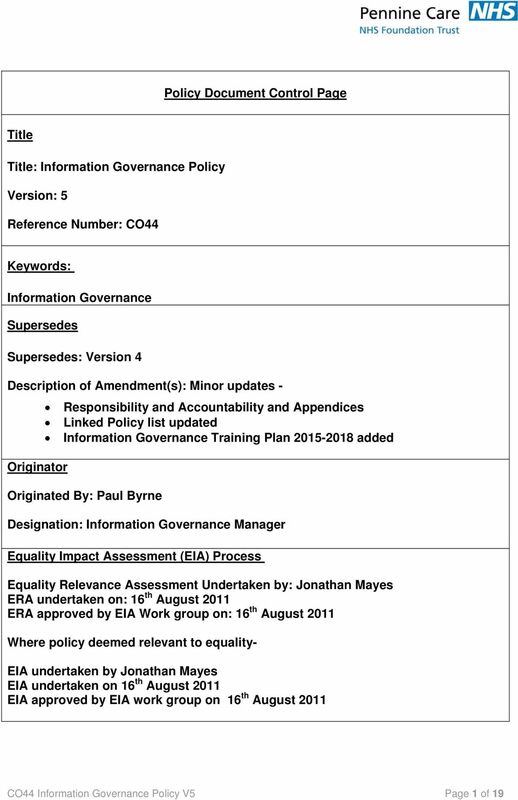 All staff should access the Mandatory IG training: Introduction to Information Governance or Information Governance The Refresher Module, through the ESR e-learning gateway. 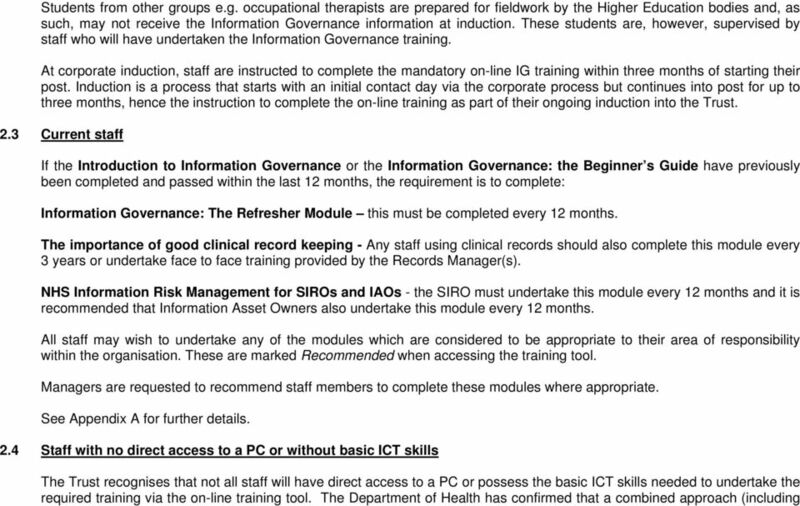 Any other modules that are mandatory or recommended should be accessed via the Information Governance Training Tool Portal, until these become available via the ESR e-learning gateway. The link is - IG training is now included within the Core and Essential e-learning courses along with all other core e-learning. All staff must register by clicking on the following link: User guides and further information can be found under the OL&D E-learning site. 4. 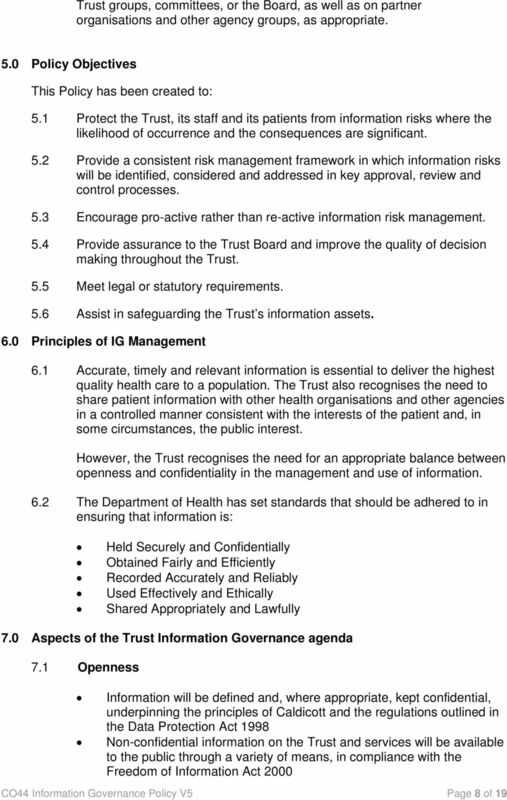 Reporting and Monitoring Responsibility for monitoring the uptake of IG training will be managed by the Information Governance Assurance Group and performance levels are reported to Executive Directors and all IAOs on a monthly basis. 19 Appendix A G:\Corporate Services\Information This Training Plan is available electronically on the Trust Intranet or (including paper copies) via the IG Department.